Gain the advantage of consistent Swim Training for Better Performance. The Vasa Sport Bench is our portable, space-saving solution for maximizing swim training when paired with the Vasa SpaceSaver SwimErg. It’s also versatile and can be used for functional cross conditioning to make improvements in strength, endurance, total fitness, and injury prevention. 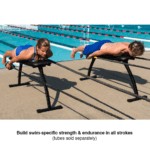 The Vasa Sport Bench will be your “secret weapon” swim training tool outside the water. 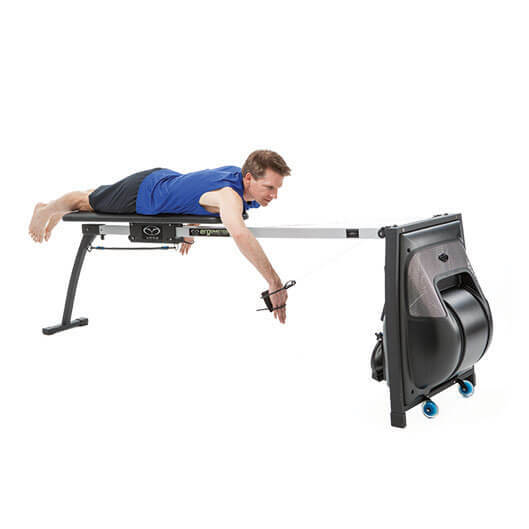 Combine the Sport Bench with the Vasa SpaceSaver SwimErg to increase power, speed and stamina in exactly the right muscles needed to make performance gains and greater speed in the water. Improve swim technique—fix common stroke flaws and transfer better technique to the water. Reinforce the “high elbow catch” (a.k.a. EVF – early vertical forearm) – a crucial technique characteristic needed for all strokes, and especially for freestyle. Vasa swim-specific training will make you stronger and durable with truly functional strength. 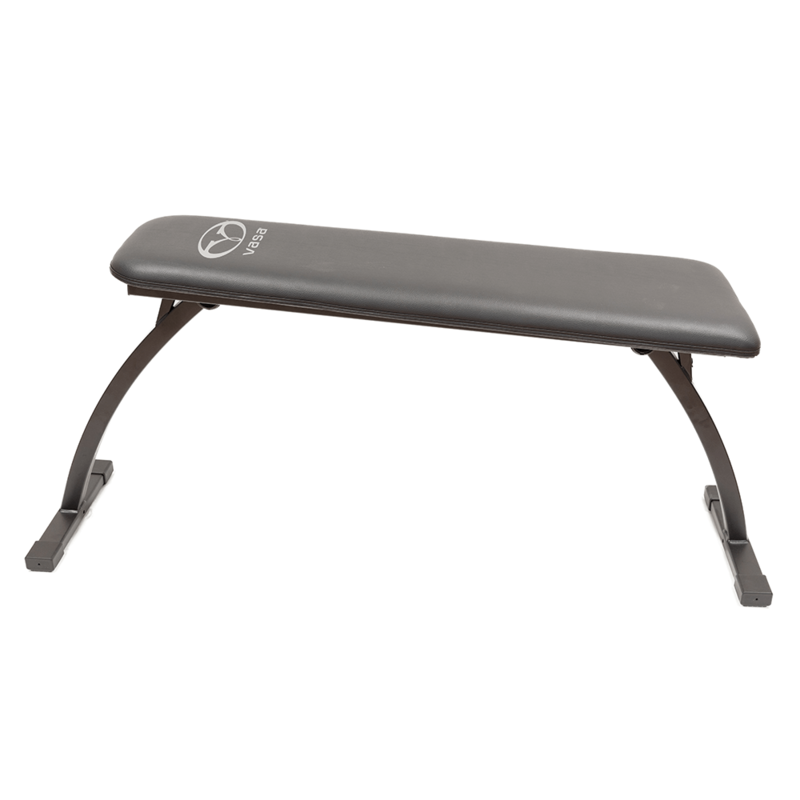 The Vasa Sport Bench provides tremendous added versatility and value since it can also be used as a weight bench for functional sports conditioning, cross training and physical therapy rehabilitation. We recommend using it with the Vasa SpaceSaver SwimErg (shown above) for maximum results. It’s also effective to use it with tubing or bands*, dumbbells, medicine balls, and body weight to perform a wide variety of functional exercises for sports, fitness and rehabilitation. If you want a versatile and portable bench to pair with a Vasa SpaceSaver SwimErg or to use with tubing or bands*, the new Vasa Sport Bench will be the perfect solution. The bench is slightly inclined, so the athlete will be in an ideal position for all swimming strokes. The folding legs have a proprietary design that provides maximum stability during use. 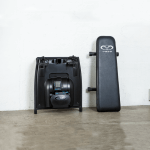 The legs fold up easily, making it lightweight and sleek for transport or storage. *NOTE: Tubing or bands are sold by a wide variety of Suppliers. We recommend the Crossover Cords made by Crossover Symmetry paired with our Power Paddles. All Vasa benches are professionally upholstered with premium marine grade vinyl covering thick foam padding over durable marine grade plywood, making it very comfortable to use and tough enough to endure heavy use by teams and clubs. 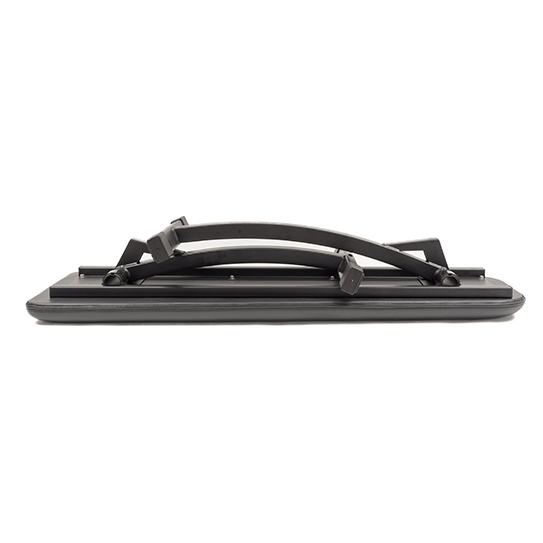 Mounted to the underside of the XL bench are two Aluminum stiffener rails, which provide additional strength and connect the bench pad to the folding legs. The folding legs are made of rugged tubular steel and finished with a durable powder coat epoxy. The base bars come with our grippy rubber foot caps. The Vasa Sport Bench is made with our XL Bench, which is tapered at the front and wider at the base. 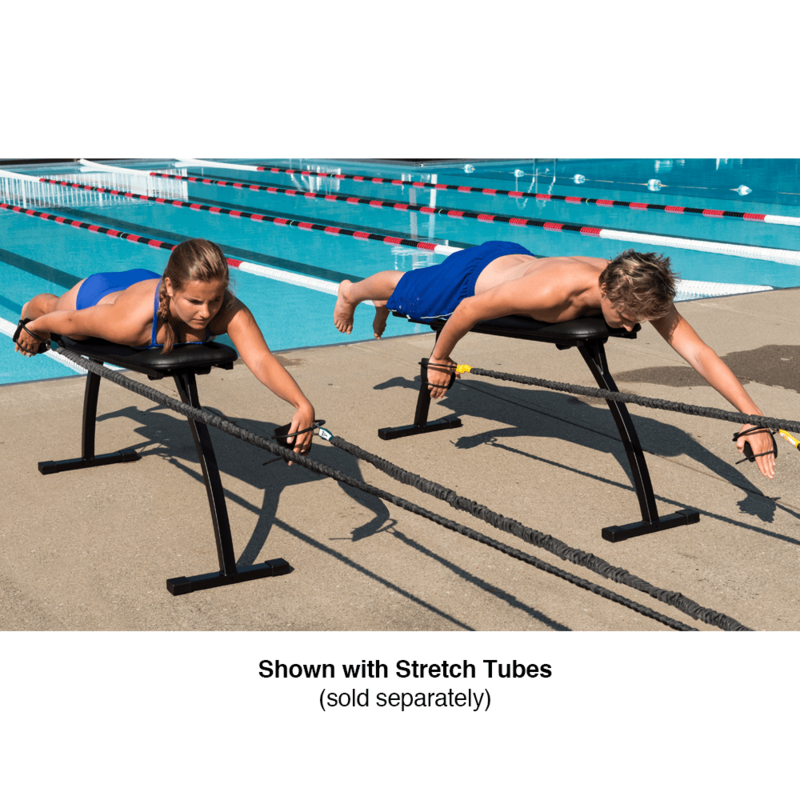 This tapered design allows for greater range of motion for swimming exercises requiring a prone position, such as Freestyle swimming. It also allows swimmers to have a better connection in the hip/core region to generate proper rotation mechanics. 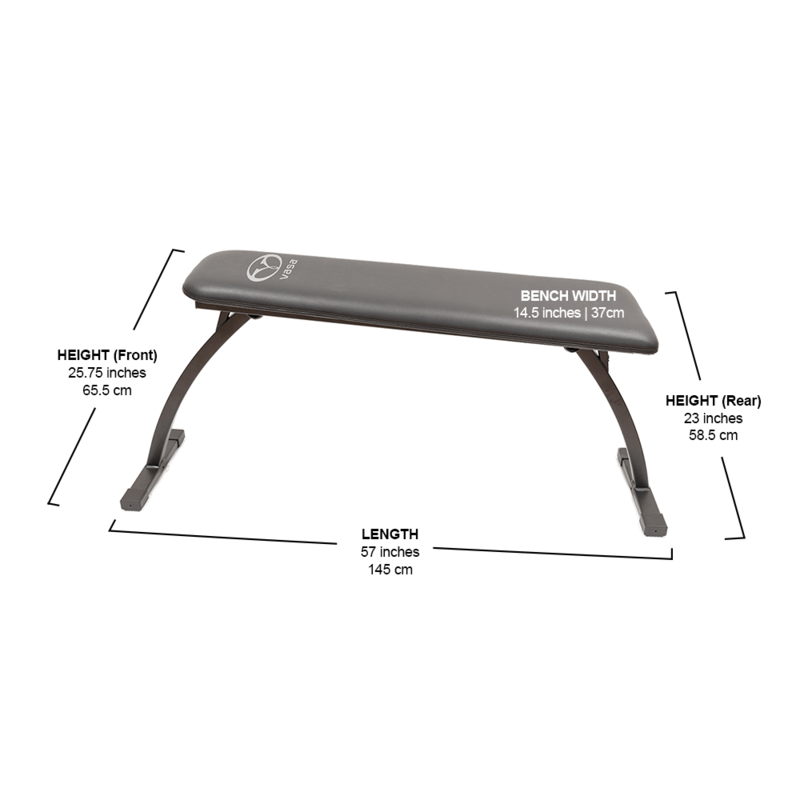 The tapered bench design provides greater stability and comfort for performing all functional strength and rehabilitation exercises. It is ideal for taller and / or heavier athletes, swim teams, physical therapy, sports medicine clinics, and fitness gyms. Add the SpaceSaverErg for a realistic, effective swimming or surf paddling workout. Fully assembled bench system with folding legs. Assembled bench dimensions: 57″ (145 cm) long, 14.5″ (37 cm) wide at the back, and 25.75″ (65.5 cm) high at the front. Folded bench dimensions: 45″ (114 cm) long x 14.5″ (37 cm) wide x 8″ (20.3 cm) high. 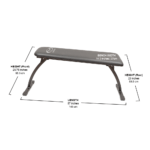 Bench pad measures 45″ long x 12″-14.5″ wide at the front & back (114 x 30.5-37 cm). Then bench is 2” thick (5 cm). It will fit most size athletes, including individuals taller than 6 feet (183 cm) in height and weighing over 200 lbs. (91 kg). PLEASE NOTE: As we are continually making improvements to Vasa products, actual items shipped may vary slightly from the images shown on our website. Shipped in 1 box measuring 46x15x9 inches (117x38x23 cm) with a weight of 37 lbs. (16.8 kg). Additional accessories may require additional boxes. 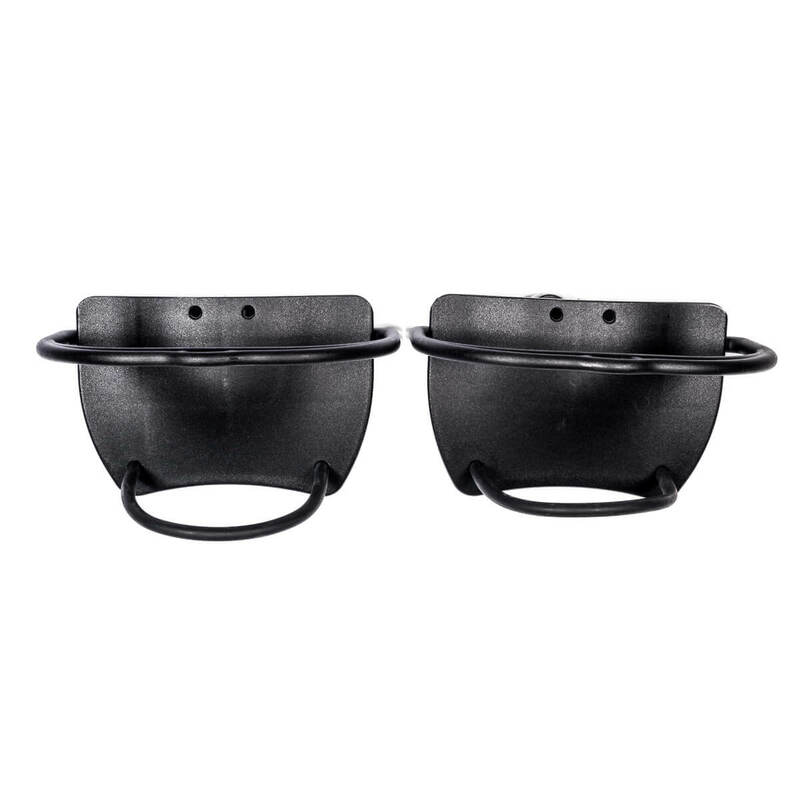 Shipping costs for Vasa products and accessories are based upon weight & location. Our shopping cart will calculate shipping costs for you or you can contact us for assistance. Attention International customers: Duty & taxes are additional and will be your responsibility at the time of delivery. Contact Us if you have any questions or need more information. Vasa has a 90-Day Improvement Guarantee. If you don’t see a performance improvement in three months, or if you find it’s not precisely what you’ve been looking for, we’ll refund the full purchase price—no questions asked. You will be responsible only for all shipping charges. How easy is the Sport Bench to assemble? Easy! The Sport Bench comes fully assembled. How much space does the Sport Bench take up? When the Vasa Sport Bench is used with the SpaceSaver SwimErg, we recommend a space of 8’-10’ long by 4’ wide, to allow the full range of motion in every direction. Assembled dimensions – : 57″ (145 cm) long, 14.5″ (37 cm) wide at the back, and 25.75″ (65.5 cm) high at the front. What exercises can I do on the Sport Bench? In addition to the primary sports-specific training, you can perform a wide range of exercises on the Sport Bench. You can do functional training exercises for strengthening abdominals, arms, back, chest, shoulders and legs. Each exercise can be performed with various type of resistance including the Vasa SpaceSaver SwimErg, free weights, or rubber stretch cords. Can I accomplish hip roll / body rotation for freestyle? Accomplishing a complete hip roll and body rotation on any swim bench cannot exactly simulate what is possible in the water. This is because the axis of rotation while swimming in water is a straight line through the center of your body. On a swim bench, the axis of rotation is about four inches below the stomach, which requires the swimmer to roll over, rather than with, the axis of rotation. In water, the body is buoyant, which allows the swimmer to catch the water at full arm extension and initiate the arm pull with a hip rotation by driving the opposite hip toward the bottom of the pool while pulling with the opposite arm. The hip rotation engages the core abdominal muscles and transfers that energy into the pulling arm. To a degree, swimmers can effectively condition the core muscles used in hip rotation while training on the Swim Erg. The padded benches on Vasa Sport Bench (and Vasa Trainer) are designed to allow the swimmer to activate and strengthen the core muscles used in hip rotation while performing Freestyle exercises. This is accomplished by simultaneously driving one hip into the padded bench just at the catch of the opposite arm. If the swimmer uses proper stroke technique, then hip rotation on the bench will activate the correct muscles of the core torso and will provide better conditioning. The difference between swimming Freestyle on the bench with and without hip rotation is quite noticeable. Swimmers can gain slight destabilization and greater activation of core muscles by swimming Freestyle while laying on a long Aeromat foam pad, a rolled up towel or yoga mat placed lengthwise on the Vasa padded bench. Can I do Swim Erg workouts to substitute pool workouts? Yes, it’s easy to simulate typical pool workouts using the combination of the Vasa SpaceSaver and Vasa Sport Bench. Many swimmers and coaches use it for intervals, timed sets or long aerobic workouts. 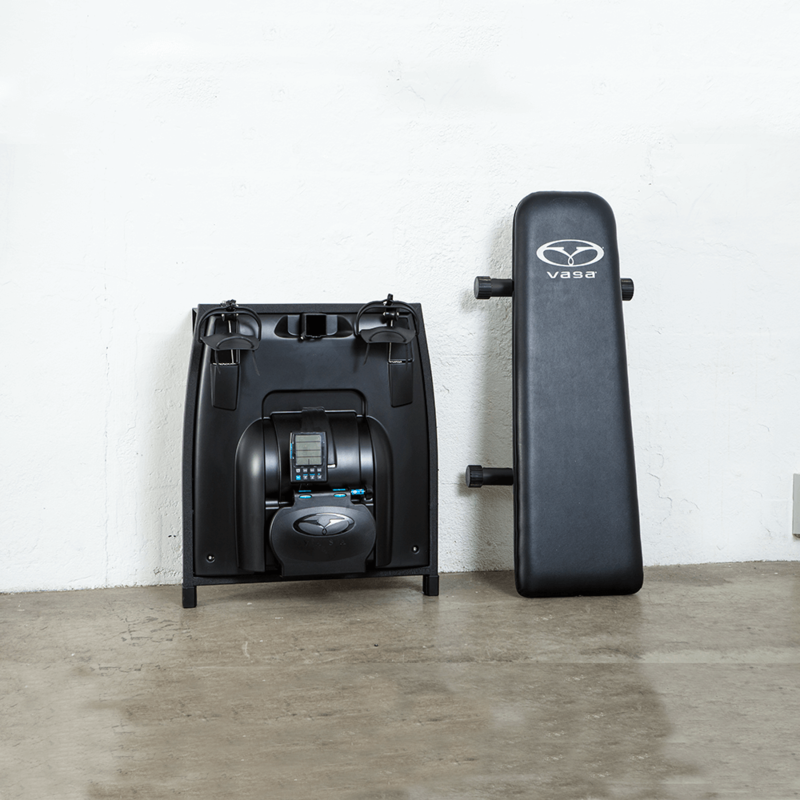 The Vasa Ergometer allows you to do swim-specific aerobic or strength sessions effectively, on your own schedule, in the comfort of your home, or club. The gains made by using the Ergometer are easily transferred to the water. I received my Vasa Sport Bench today and I love it. I was impressed that it came fully assembled. It is a perfect addition to my Space Saver Vasa Erg. I’ve already envisioned its use with a number of other applications. The fact that it folds is a great feature for me as I have over 60 pieces of exercise equipment in a relatively small space, hence organization is of paramount importance. This bench when folded leaves a very small footprint. It is quite sturdy and feels solid as I perform my swim movements with the Erg. 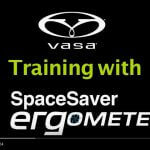 In my personal collection of exercise equipment I have two Vasa Trainers and the Space Saver Ergometer. I’ve been a huge fan of Vasa for many years and my new bench will add an important dimension to that collection. Thanks, Vasa for making this bench available. 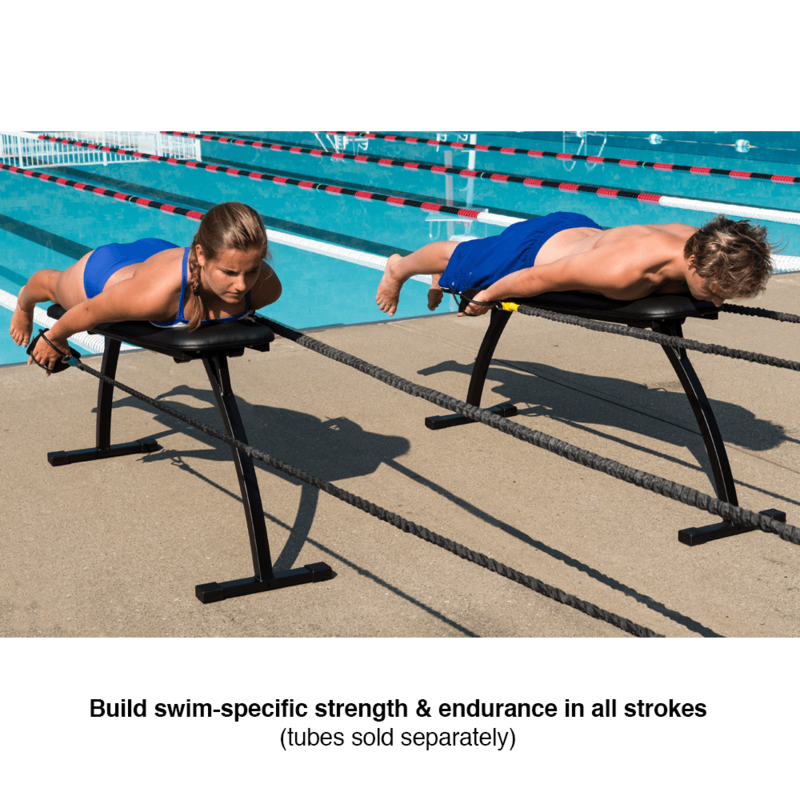 The Vasa Sport Bench is a well-designed and versatile tool that will become the mainstay of any swim specific and strength program. The compact design allows the bench to easily be folded and stored away for saving space. It’s ideal to use with SpaceSaver SwimErg for swim-specific training. It is also an effective bench for strength training and rehab. We have several standard Vasa SwimErgs and a SpaceSaver SwimErg in our strength & conditioning facility at Montverde Academy. We use the Sport Bench with a SpaceSaver SwimErg for the swim teams, and with our baseball and softball athletes for injury rehab and recovery exercises. 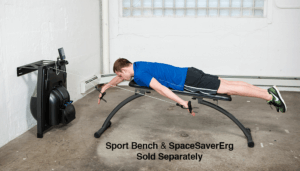 For use in a home or garage gym, the Sport Bench saves valuable space. 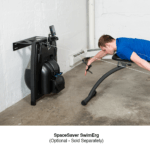 When paired with the space saver ergometer, this gives you the ultimate swim specific training device. It also doubles as bench for strength training exercises. IMO, it is a must-have for any home training set up.